The South African Reserve Bank (SARB) announced in its last quarterly bulletin that household debt as percentage of disposable was 72.7% as at the end of 2018. That is to say that almost 75% of households available funds are spent on debt. A worrying sign for an economy whose consumers contributes almost 60% to the economy. Debt is like an anchor for a ship. It weighs a person, business or country down. If a person, business or country has to much debt, to much money is spent of paying the interest on debt, as well as paying off the actual debt amount. And this is currently where South African consumers, and in fact the South African government finds itself in. The next paragraph is an extract from the latest Qaurterly Bulletin from the South African Reserve Bank. "Household debt increased at a faster pace in the fourth quarter of 2018. Mortgage advances, the largest component of household debt, contributed the most to the increase. General loans and advances at all monetary institutions also increased notably, suggesting that consumers borrowed to sustain spending. Household debt as a percentage of nominal disposable income edged higher from 71.8% in the third quarter of 2018 to 72.7% in the fourth quarter, as the quarter-to-quarter increase in household debt exceeded that in disposable income." "Debt-service cost to disposable income increased marginally to 9.3% in the fourth quarter of 2018 from 9.1% in the third quarter, consistent with the 25 basis points increase in the prime lending rate in November 2018 and the faster growth in household indebtedness in the fourth quarter of the year. However, for 2018 as a whole, the ratio of both household debt and debtservice cost to disposable income decreased"
So essentially almost 10% of money that households have to spend on a monthly basis goes towards paying off interest on debt, and fees related to honoring debt agreements such as monthly admin fees. 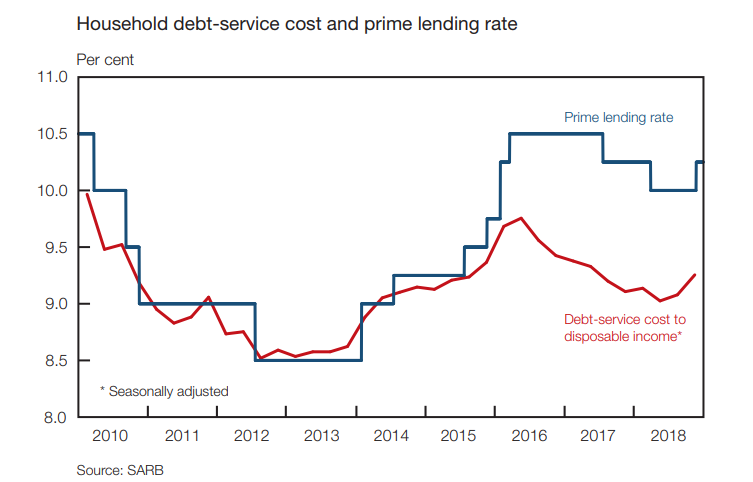 The image below plots the prime lending rate (the standard interest rate charged by banks on debt against the debt service cost to disposable income). Worryingly for South African policy makers (especially monetary policy makers) is the fact that debt servicing costs as percentage of disposable income is on the increase, showing consumers are becoming more indebted, so any interest rate increases will hurt consumers big time, and this in a economy where consumers are already struggling and the economy barely showing signs of growing. 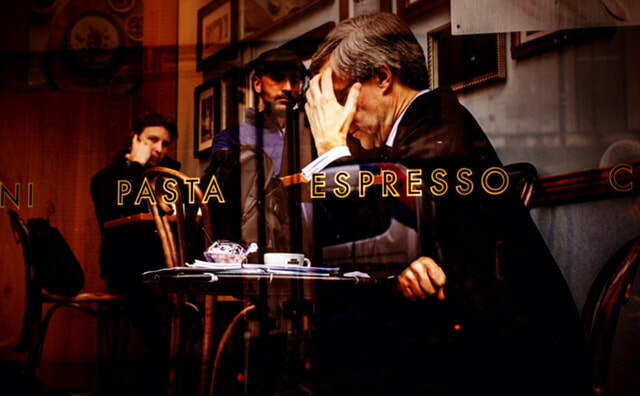 We feel that greater awareness campaigns regarding consumer debt levels and the dangers of such debt levels should be launched in order to educate the public at large about the current worrying levels of debt and debtservice costs as a percentage of disposable income. To our readers, only take on debt when you really have no other option. Dont get stuck like a boat with its anchor down and massive waves approaching.